In today’s highly competitive business environment, effective and reliable communication is critical to the success of your business. Providing the latest Voice over Internet ProtocoI (VoIP) technology and comprehensive desktop solutions that deliver superior performance, efficiency, flexibility, and reliability when and where you need it, is key to survival and growth in today’s information-driven business environment. With over 100 years of building powerful communication and technology solutions, NEC understands the numerous and ever changing demands and challenges that exist in today’s growing market. NEC accepts these challenges and meets the customer’s demands for a connected world – head on! NEC leverages its strengths to bring forth innovations, and to integrate those innovations into new products that will provide seamless communications, customer satisfaction and manageability throughout your organization. This powerful combination of innovative design, high quality assurance, and maximum integrated solutions creates a converged business environment and a highly competitive advantage. NEC offers a winning strategy for their customers, empowering them to take advantage of new opportunities, and trust that they have invested in a sound communication server for today and tomorrow. NEC’s UX Voice Mail Solutions . . .
UX IntraMail and UX Mail are full-featured Auto-Answering Voice Messaging Systems that offer you a multitude of time-saving options to help you manage your communications more effectively and efficiently. 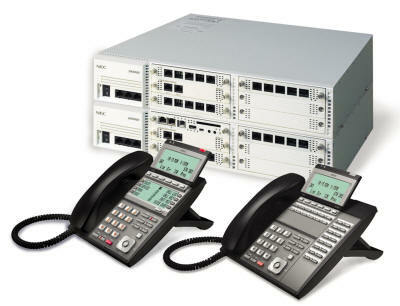 They are powerful, versatile, and an integrated part in the UX5000 Communication Server platform. UX Mail and UX IntraMail deliver abundant message storage, scalable port capacity and all the features you’ve come to expect from NEC, a global leader in communications and voice messaging products. The sophisticated Automated Attendant ensures that your calls are answered and routed quickly and efficiently. Both systems automatically answer incoming calls, provide multiple company and personal greetings, offer a wide variety of dialing options (i.e. press 1 for Sales, press 2 for Service), and record individual voice messages.